Brandon Batchelder, Chloe Barcelou and their tiny house contraption. Some say the Tiny House movement dates back to 1854 when Henry David Thoreau first described the economy and aesthetics of small home living in "Walden". But the movement didn't gather much steam until 1998 with the publication of Sarah Susanka's "The Not So Big House" - and itty bitty houses began to literally dot the landscape. 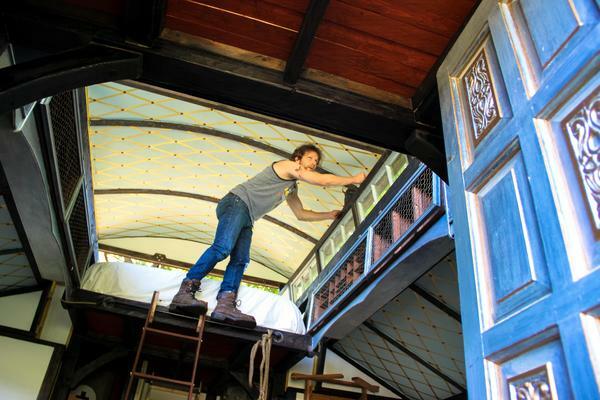 So when we heard about a tiny house in Hampton, NH - that was on wheels, that looked like a steamer trunk, that was made of recycled movie sets - we sent Sean Hurley to find out more. Chloe Barcelou and Brandon Batchelder work together in the movie industry. A team of sorts. Chloe designs sets - and Brandon builds them. But work is hard to find and every new job means a move to a new place. For months at a time they live in hotel rooms. For a year they live in a 20 by 20 shed. All the while and since the moment they met, they've talked about building a house together. They don't know exactly where, but they know exactly what - a tree house. "I know with Brandon it'll be made really well. But it'll be really messy," Chloe says. Brandon smiles and shrugs, "Oh thanks. Quote of the day," he says. Last year, they were hired to work on Aimy in a Cage, an independent film shooting in Boston. A windfall of sorts. A big, well paying job for both of them. And it was then, Chloe says, that a new pre-tree house dream began to take shape...of a tiny house on wheels. "It was the first time that we would ever have any sort of chunk of money as opposed to like scrounging from paycheck to paycheck," she says, "and we would also have the materials because we knew we were going to build Aimy in a Cage out of two by fours that would end up going into a dumpster." 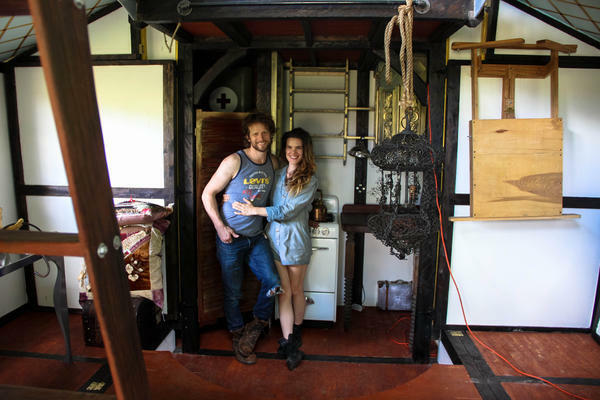 And so, last summer, with a chunk of money and 700 two by fours recycled from the movie set, Brandon and Chloe posted a curious request on Craig's List: "Hideously Smitten Couple Needs Temporary Build Site for Charming, Innovative Tiny Home Contraption." 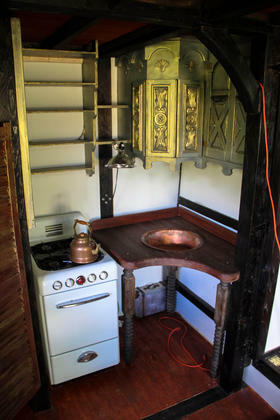 Gerhard and Lynn Blume in Hampton responded to the ad and in September of 2014, the hideously smitten couple parked a somewhat hideous trailer in the Blume's back yard and began to design a 300 square foot house on wheels. Chloe recalls the process, "He made like 3-D models with Styrofoam at first to prove that it would actually work and then he went on to make renderings on Google Sketch Up. I think our first inspirations were Tudor homes. But a sharply pitched Tudor roof, they soon realized, would create a lot of unlivable space and Brandon went back to the drawing board. "I just looked for something that would inspire me," he says, "and I came across steamer trunks and there's something really beautiful and elegant about the shape and that kind of drew me to gypsy caravans. 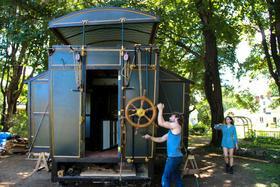 So then we started drawing inspiration from ships and it started to look like an old stagecoach." They began to build in the fall and when winter came, Brandon says things got tough. "We were able to borrow a kerosene heater from Gerhard and put a huge tarp over the whole thing. But even still there was like it was a constant battle. The winds were constantly tearing the tarps off. And it was hard to do anything. We're still cold. We really are." Still cold, but nearly a year later, Chloe says, "We're like really close to being finished but not quite finished. It feels like a never-ending list of tasks that we have to finish before we can move in. I think our motto building this has been 'I didn't think it would take that long. 'It's literally been with every single thing that we've made." 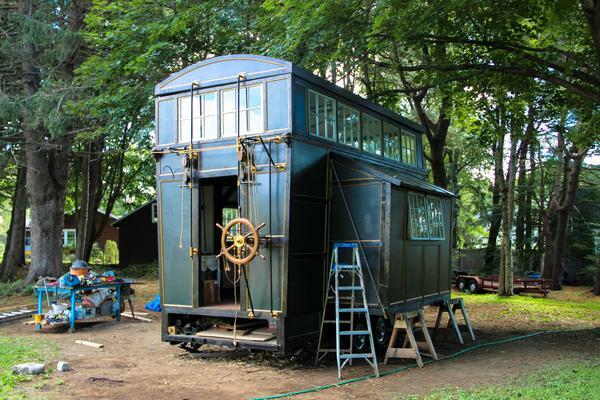 With it's wooden ship's wheel and system of roof raising pulleys, their black and gold gypsy caravan slash ship slash train slash steampunk steamer trunk would look perfectly natural pulling up to Hogwarts. But the interior, Chloe says, is completely different, "On the inside it sort of a little bit of a surprise. You almost expect it to be dark and sort of mysterious on the inside as well but I kind of wanted it to look like a jewelry box or a Fabergé egg. You walk in and it's bright and airy and unexpected a little. Outside, above the blue front door they salvaged from an old restaurant - is a blank space that will one day be printed with the name of their little house. Chloe isn't yet happy with the names Brandon's come up with. "He wants to call it the Millennial Falcon but that's not to happen!" But Brandon says he other ideas, "Ship. The ship, I call it a lot. Or ship house. I heard a kid call it a 'ship house' - that was pretty cool." For obvious reasons, Chloe says that's also not going to happen. 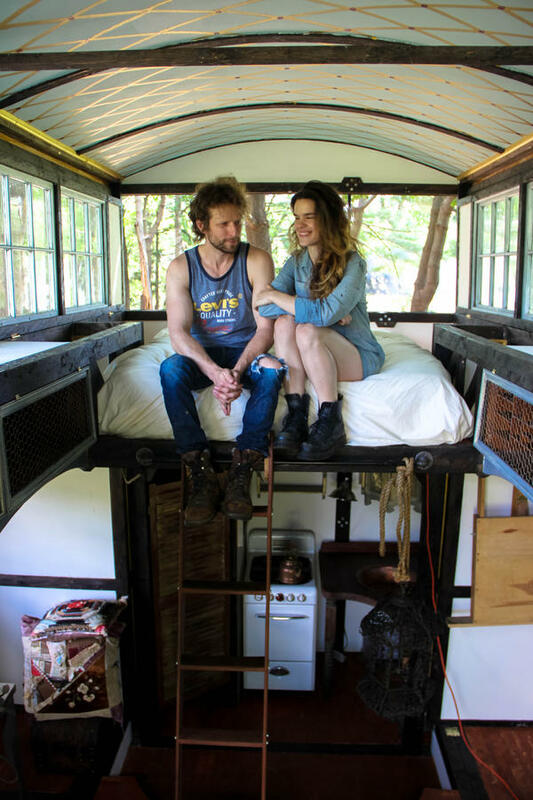 "We don't intend to live in it for the rest of our lives either," she says, "Like some people who build tiny homes do it as a retirement option but this is like a two year plan for us. We eventually want to do like a tree house hybrid. When we met that was what we started talking about way before this came into the picture." Brandon says their real plan is to use the tiny house to convey them toward their final destination. "We don't know where we want to settle down but we know we want to someday build our dream house. So this is an opportunity for us to go around the country and sample different places and get a feel for it. I think the main concern is to be around nature and good coffee. If we can find that balance I don't really care where we are." The ship's wheel creaks as the hemp ropes strain to lift the heavy roof. It takes about an hour to convert the house from travel mode to living mode. And once the windows are installed and the pop-out walls pushed into position, Brandon says, "You're surrounded by everything that you made. It's like you build a fort and you're staying in it." 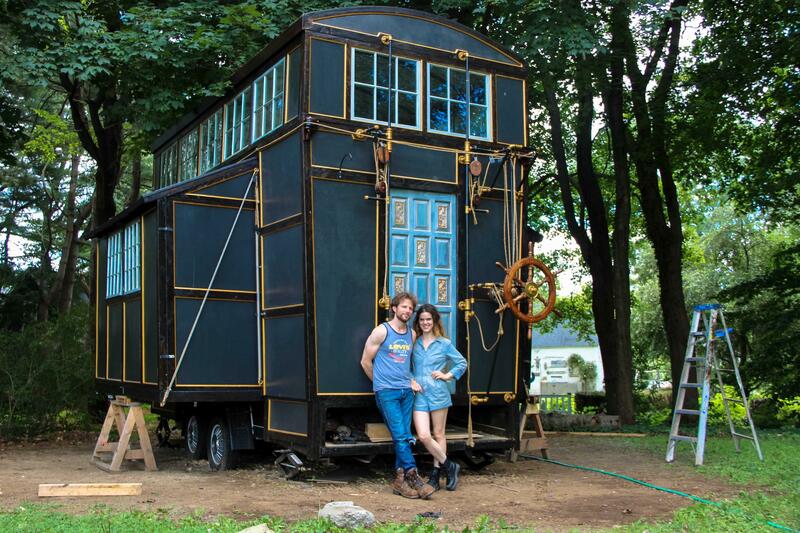 In the next month or so, Brandon Batchelder and Chloe Barcelou will hitch their trailer house to a truck and pull it out of the Blume's back yard. "The plan is to find work and go to it and to just keep doing that and keep seeing the country and keep working," Brandon says. It'll take them to their next job - hopefully near good coffee - and eventually, some day, into the neighborhood of an agreeable tree. Copyright 2015 New Hampshire Public Radio. To see more, visit http://nhpr.org/. I live in a small house on a street of big houses. And when I say big, some of the houses on my street are 7,000 and 8,000 square feet. A big house signifies an important person, right? The governor lives in a mansion. The Archbishop of Hartford lives down the street from him in a house that's even bigger. New Haven was once known as the “model city” - for a massive urban redesign in the 1950s and 60s. That renewal - 50 years later - has divided the city. Literally and emotionally. Now, some of the damage is being repaired - a plan to reconnect a “downtown” crossing where homes and businesses were destroyed to make way for a highway.